Ready to spend a relaxing vacation on the Beach!! Our Beacons Condo 'Beach Bummin' is located on the BEACHSIDE (no roads to cross) of Hwy 30A in Seagrove Beach.. We are exactly ONE mile from the center of the SEASIDE Town Square. Walk or ride to the many Seaside and Seagrove shops and restaurants. A Publix grocery shopping center is just around the corner. 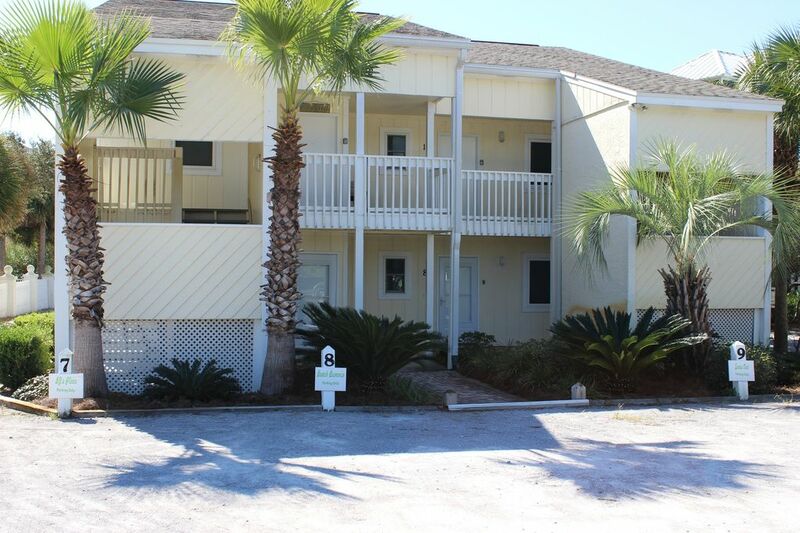 Our convenient first floor unit is in the second building back from the beach. Only a few steps to the beach, you can easily walk from our condo’s back door to the private beach access within seconds. There you can view the sugar white sands, aqua waters and enjoy the dolphins passing by while watching the sandpipers pecking in the sand. There is a seating area at the walkway to watch the sunset as the day draws to an end. This is not 'just a rental', but is our second home and is being continually updated. Our Condo’s recent renovation's include brand new bathrooms. The master bath has a shower with jet sprays. Past renovations included new tile flooring, kitchen appliances, cabinet doors and hardware, faucets, paint, interior doors,windows,hardwood flooring in bedrooms and trim moldings. The master bedroom has a queen-size bed with it’s own private bath. The guest bedroom has two full-size beds and is located right next to the hall bathroom. We have a fully equipped kitchen with all the utensils needed for any meal of the day. The unit is also furnished with a washer and dryer unit for your convenience. For those who can’t get be away from their e-mail, wireless Internet is available. The living room features a 42' flat panel TV along with a DVD Stereo unit. Each bedroom has it’s own TV.. There are many local shops and restaurants within walking distance. While we do have our favorites, check our information booklet in the condo for menu’s and flyers. Miss the Mall? Destin or Panama City is only 30 minutes away with Outlet Malls in Destin or the newly opened Pier Park Center in Panama City Beach. Relax and take a ride/walk on the 18-mile bike/walking trail out front of the condo that parallels 30A from Inlet beach to Blue Mountain Beach. The trail has nine miles of off-road trails and runs alongside lakes, through woodlands and beach areas. Bikes are available for rental at several nearby locations. OR Just enjoy the sun and sand, after all you are on VACATION! Great location....Just steps to the Beach, NO roads to cross. No crowds. Restaurants and shops close by. Condo close to the Beach, Private walkover, Peaceful and relaxing atmosphere. One designated Parking Space Due to limited parking, our Condo Association does NOT ALLOW Golf carts. The picture of the condo did not show how cute the accommodations really represent. The location is ideal and can walk to several restaurants and shops!! The perfect small condo for a quick getaway! Very very clean and convenient to everything! Will definitely be returning. Great location! Clean and very convenient to beach. This was our second stay there. Great location, great condo! Win, win! Our family has been coming to the Destin/Panama City Beach area for over 30 years. About 14 years ago, we stayed in Seagrove Beach for the first time and it has been our go-to family vacation spot ever since. We have stayed in many of the larger homes with our big family (6 children + others), but now that we are almost empty nesters, we decided to try DJ's place since it was on the beach side of 30A. We were not disappointed! This condo is in a great location. We parked out car for the entire week and were able to bike to Seaside, the local Publix grocery and restaurants. When we wanted to be on the beach, it was literally a quick walk thru the yard and path to the beach access stairway and overlook. I could take my morning coffee to the overlook and enjoy a slow wakeup with an ocean view. It was really perfect. The condo was very well equipped for cooking. I've been in large houses that sleep over 20 people and had to buy all kinds of basic cookware and supplies in years past. We had a large shrimp boil down the road in Seaside at our extended family's place and carried the shrimp pots with us because we were better equipped than they were!!! The back porch was also a great spot to sit and enjoy the beautiful yard. The condo is right on 30A, so there is some noise in the early morning and evenings, but after dark it gets very quiet. We slept great the entire week we were there. I highly recommend renting from Betty. She was quick to respond to emails and really made the entire process very easy. Our security deposit check was returned within a week of our arrival back at home. Overall, this was just a great experience. I'm already looking at when we can return next spring (or maybe I can figure out a way to get there this fall)!!!! Delightful condo in a fantastic location! We were in town for the Seaside Half Marathon and loved staying here! It is easy to access, simple to park, just steps the beach, and an quick 1- mile stroll to the heart of Seaside. The condo is lovely and comfortable, and the owner is great to correspond with. We cannot wait to return another time! We would give Beachbummin' 4.5 stars if that were an option. We absolutely loved the location being so close to the beach and an easy bike ride into Seaside. Having our own reserved parking spot right up front was also a plus! We were very happy to have a clean and bug-free condo as our friends in a house across the street were infested with flying insects during the same week. We loved being able to do our laundry in our condo, too. We loved being on the first floor and have the patio to park our bikes and beach toys. We did, however, hear the neighbors above us stomping around. I would recommend that future renters bring their own paper towels, toilet paper, and dish/laundry detergent as we were only given the one roll on each of the dispensers and the toilet paper/power towels that we were given were very cheap and scratchy. Also, make sure you bring your own spices for cooking as there was only a small salt and pepper shaker in the cabinet. Otherwise, the kitchen had all of the kitchen appliances/tools that we needed (minus a large crockpot). Overall, we would stay at this property again as it was clean and fit our needs for our family. Cancellation Policy: If you need to cancel prior to 30 days of check in, your deposit will be refunded minus credit card fees (if used). If you cancel within 30 days of check in, you will only be refunded (minus c/c fees) if the unit is re-booked.